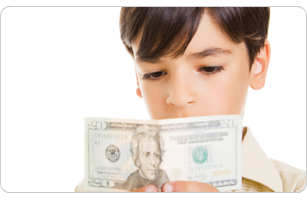 Want your child to have the money savvy of Warren Buffet? Start with these tips. The other day my three-year-old son said to me, “Just go to the bank and they’ll give you money,” after I told him we couldn’t buy a toy he wanted. I realized it was time to explain to him where money comes from. After all, “it’s up to parents to teach their kids smart financial habits,” says Jayne Pearl, coauthor of Kids, Wealth, and Consequences. Not sure where to start? Here, Pearl shares the most important money lessons for young children, and how you can help your child ace them. $ Lesson 1: Money doesn’t grow on trees, honey. When kids see bills pop out of the ATM, they don’t realize that money is a finite resource. Explain that you work to make money, and the bank is just a place that keeps it safe (try to banish your cynicism about the recent economic crisis!). $ Lesson 2: Work with your budget. The best way to teach kids to start managing money is to give them some. If they blow their allowance on a new Star Wars figure and don’t have enough left for a DVD they really want, that’s actually a good thing: “They learn first-hand the consequence of overspending,” says Pearl. $ Lesson 3: Good things come to those who wait. Teaching kids delayed gratification will help combat the “buy now, pay later” mentality that could mire them in credit card debt later on. So as much as you can, reinforce that waiting pays off. For instance, make a homemade pizza together with all the ingredients your child loves, then microwave a store-bought frozen one. The homemade pie takes longer, but it tastes way better. $ Lesson 4: Don’t spend it as soon as you get it. Curbing impulse buying goes hand in hand with teaching delayed gratification. Show by example. Before you go shopping, create a budget. Outline what you’re going to buy, what stores you’re going to, and the price range for each item. Then compare prices online and clip coupons together (consider letting your child keep the savings so she sees that bargain-hunting pays). She’ll learn that planning out purchases before you buy is the routine. $ Lesson 5: Saving is cool. Your daughter wants a new doll that she doesn’t have enough money for? Tell her to save up! Once has enough, take her shopping and let her pay the cashier herself. She’ll never forget how good it feels to work towards a goal and be rewarded in the end. $ Lesson 6: Keep track. Simply knowing where her money is going is a big step forward in your child’s money management skills. Have her use a notebook or go on a computer to keep track of her money. Make a file (or use an old purse) where she can store receipts and statements. $ Lesson 7: Have a wish list. It’s hard for kids to set priorities, so sit down together and make a wish list of the things your child wants to do with her money. Then help her rank the list by discussing what’s important about each wish. $ Lesson 8: Make the most of savings. Introduce your child to savings vehicles that could earn her interest, such as savings bonds and certificates of deposit. Search for a compound interest calculator online and show her how just $1 can grow with interest over time (and check out ThreeJars’s Allowance Calculator, which shows the allowance you got as a kid in today’s dollars). She’ll be amazed! $ Lesson 9: Be a little skeptical. While you don’t want your child to think companies are out to get them, every now and then, point out manufacturers’ sales tricks. “Healthy skepticism is crucial not only so kids can resist the allure of products on TV, but it also helps keep them from buying into the messages behind the ads—like if you have the right clothes and toys, you’ll be popular,” says Pearl. Have your kids donate a portion of their allowance to charity. It teaches them that money can be used to help people, rather than just for buying things. Remind them that it’s not how much you give—every little bit counts.